How long before I start seeing results on Amazon? It’s a good question. A legitimate one that we hear from prospective clients now and then. How long will it take for my brand to start seeing results on Amazon? If you’ve already launched on Amazon and are struggling to reach your sales goals, or you haven’t launched yet and want to get started off on the right foot, Bobsled can help you reach your goals, and in less time than you might think. How much time, exactly? While we can’t see into the future and predict exactly what is going to happen with each brand we work with, we can use data and experience to give you a good idea. The majority of brands Bobsled works with will see results, in the form of Amazon sales, in the first 2-3 months after starting to work with us. Some elements (like PPC advertising) will start seeing results sooner, and some harder to reach goals (like a healthy flow of buyer reviews) will take a little longer. The time it takes to reach your sales goals is partially dependent upon the category your product falls into, but with the right strategy, you can drive towards those goals, potentially faster than you think. Once a brand begins to gain traction on Amazon, growth becomes a little more predictable, but how long does it take to gain that initial traction? Bobsled clients that partner with us to launch on Amazon typically start seeing significant results on Amazon within the first 3 months after launch, with several of our brands reaching halfway to their targeted average monthly sales volumes by that point. By the 6-month mark? Many brands can expect to see their sales volume double what it was at the 3-month mark. So you want to know what your sales could look like on Amazon? Let’s look at a specific example of a Bobsled client that went from zero to $63,000 in monthly sales in an 8 month period. By month 2 the brand had reached half its current average sales volume and continued to climb for the following six months to the month 8 average. This brand is positioned well in the sporting goods category, which is a competitive category, but has also seen sales growth of 11% year-over-year. This brand took advantage of Bobsled’s industry expertise to launch their brand on Amazon with A+ content, optimized product pages, professional images, a comprehensive promotion strategy, and inventory forecasts to make sure their product inventory was meeting demand. The brand continues to see excellent PPC performance with ACoS levels typically less than 2.0%. Because of this success, the brand confidently expanded to Canada in month 7 and the United Kingdom and Germany in month 8. Now this brand is bringing in an average of $63k in monthly sales that didn’t exist before they launched on Amazon. Brands that are already established on Amazon may ask, what is it that Bobsled can offer that you are not already doing in your account? The answer is that we bring our extensive industry expertise to the table, with a team comprised of prior Amazon brand managers and PPC experts. Our full service offerings further develop the front end, back end and all PPC aspects of your account. Below are the results that our clients experience after partnering with Bobsled to optimize and manage their brands on Amazon. 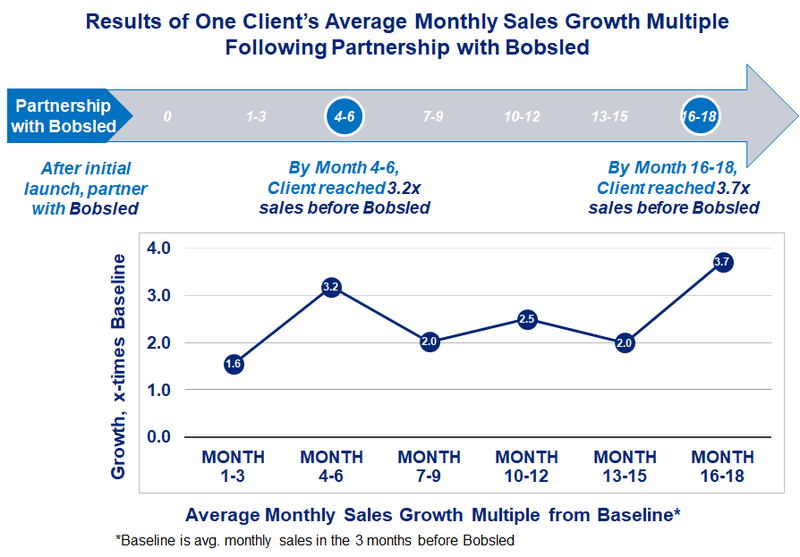 After partnering with Bobsled, our clients see on average over 100% increase in average monthly sales by months 4-6. The above data includes analysis of 13 account management clients. 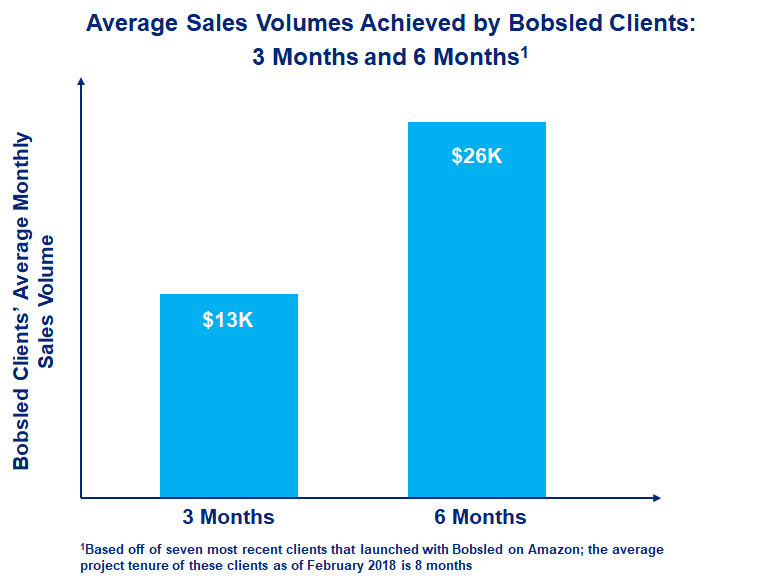 We exported Amazon sales volumes and first calculated the average client sales during the three months prior to Bobsled partnership (“baseline”). 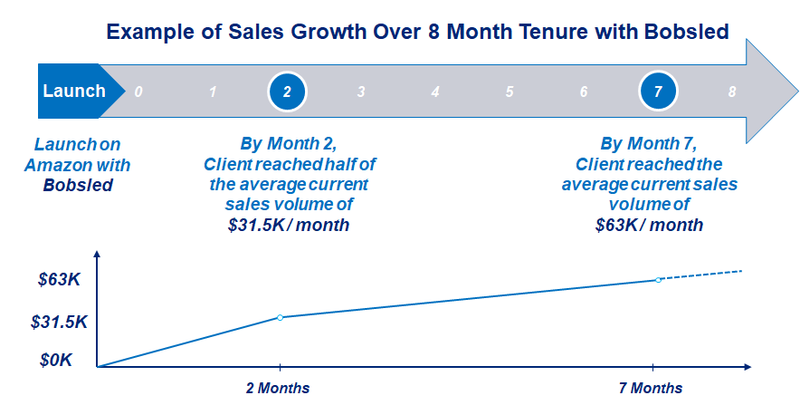 We then calculated the average sales growth we saw of the subsequent three month periods relative to that original baseline value. 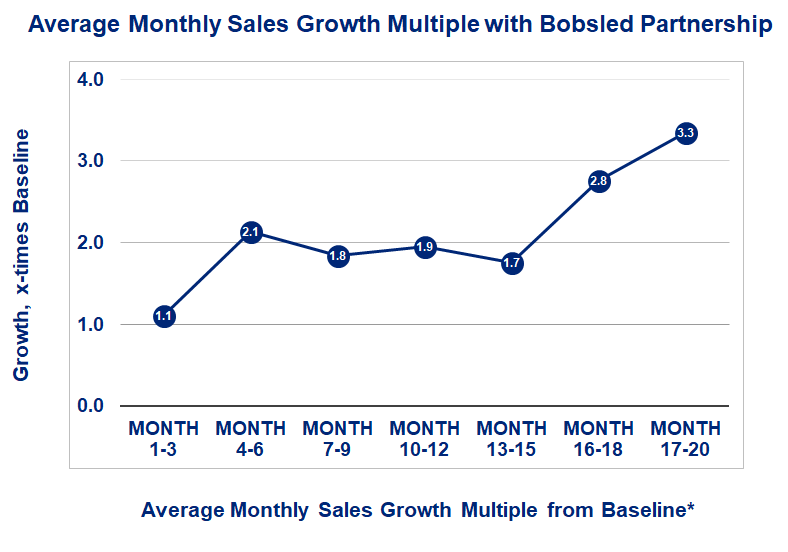 From our analysis we show that Bobsled sees over 10% increase in our brand’s average monthly sales in the first three months and over 110% increase in sales in the four to six month period. This growth continues throughout the first year of our partnership as we refine our strategies and we learn what works best for you and your brand. By the year and a half mark, we typically see further leaps in growth as our brands succeed in the marketplace. Let’s look at a specific example of the monthly sales increase that one client, who was already established on Amazon, saw after partnership with Bobsled. We will consider the average monthly sales before partnership with Bobsled to be the baseline. Baseline is 1.0. In the one to three month period immediately following our partnership we saw average monthly sales increase by a factor of 1.6x baseline. In the next three months we saw sales increase by a factor of 3.2x baseline. How did we do this? Every brand faces different challenges and opportunities within their categories on Amazon and determining exactly where we could add the most value really paid off. In this example, this brand had operations difficulties related to manufacturing as well as an overall lack of Amazon ‘expertise’ (including challenges with communication with Amazon.) Originally sellers on Vendor Central, we helped this client launch on Seller Central to compete directly with Amazon’s MSRP offer on their original product. So, in addition to the critical product page optimization, advertising strategies, inventory management issues, etc., we addressed where this client could specifically make the strongest gains on Amazon. While Bobsled prides itself on producing great results for clients, you may be wondering if these numbers are attainable for any type of product. The answer is that there are some categories that tend to be more competitive than others. If your brand falls into one of these competitive categories it may take you a little longer to reach sales goals, or your ACoS may be higher than that of a brand in a less competitive category, but we still believe you can reach your goals with the right strategy. Some of the most competitive categories on Amazon are Health & Personal Care, Grocery & Gourmet Food, Beauty, and Sporting Goods. How much can my brand make by selling on Amazon? I’m glad you asked. Amazon is a huge marketplace with an even bigger following. Just to give you an idea of the magnitude of the market your brand can reach on Amazon, “Amazon now has 90 million Prime members in the U.S. alone.” This means that 90 million American shoppers are invested enough in buying on Amazon that they pay for an annual membership to make that shopping even easier. “Amazon was responsible for about 44 percent of all U.S. e-commerce sales last year, or about 4 percent of the country's total retail sales figure.” The areas that gained the most of this 44 percent market share were luxury beauty, pantry, grocery and furniture. There is an increasingly large number of people looking to Amazon to sell and ship them the things that they used to drive to their nearest big box store to purchase. Programs like Amazon Prime and Subscribe & Save are making this easier than ever. The great news here is that a smaller, less established brand can show up in an Amazon search next to a brand that’s been sold in retail stores for ages. This gives smaller brands a leg up when it comes to competing with the big guys. As a brand, if you compare setting your brand up on SC with selling to retail outlets like Walmart or Target, you can see why Amazon has become such a popular sales platform for brands who want to expand their market. Sales don’t happen by accident on Amazon though, there’s still work to be done, but with a partner like Bobsled you’ll be on your way to reaching your sales goals in no time (i.e. three to six months). Here at Bobsled we love seeing our clients reach their sales goals on Amazon. It’s a great avenue for brands, big and small, to reach new markets and create loyal customers. We pride ourselves on helping brands navigate Amazon. 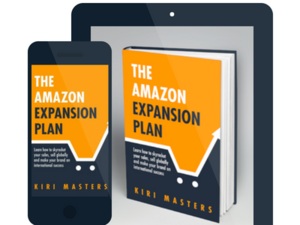 If you’re feeling overwhelmed by the idea of launching your brand on Amazon, but you also feel it could be a huge win for your company, let’s talk!